Ah, the last of the classic 8-bit Atari consoles – it looks and feels like a pre-crash system but was not actually released to the mass market until 1987. By that point, Atari’s bad timing and outright market foolishness were already becoming the stuff of legend, and looking back on it, it almost seems ridiculous that anyone could think this thing could compete with the NES. Especially considering Nintendo’s two year head start. I mean, just look at this comparison, consider the technical aspects alone and tell me how Atari thought they had any chance. It’s pretty common knowledge that Atari had the 7800 ready to go in 1984 (itself a little strange, considering how new the 5200 still was), and they in fact did release a small number of units to stores, but pulled back to re-focus on their PC business. Their gun-shyness continued when Nintendo approached them with an offer to license their Japanese Famicom system for sale in the United States, and Atari declined. The rest, as they say, is history – Nintendo released the NES themselves and took over the market. Atari belatedly re-released the 7800 once it became clear that a console market still existed, but it was a doomed venture from the start. It all seems so obvious and predictable in hindsight. 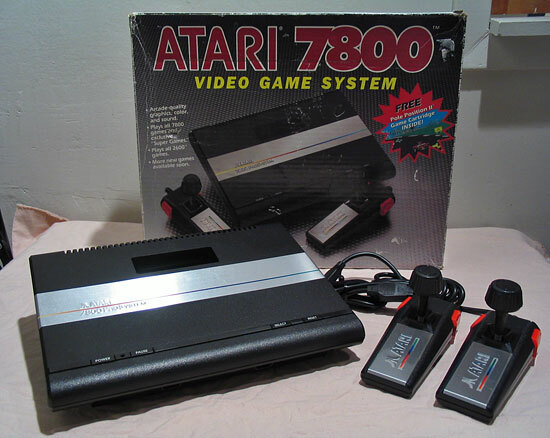 The 7800 was the last Atari system I bought – I owned an NES like everybody else at the time, and later a Genesis. My 7800 came used from Ebay, $43 for a boxed system with 19 games (mostly 2600). Not bad by today’s standards, though I was a little disappointed that my system is not really “mint, like new, without a scratch on it” as the auction description stated (it’s in decent shape, but it’s definitely got a few scratches and a dent or two). Everything works, though. 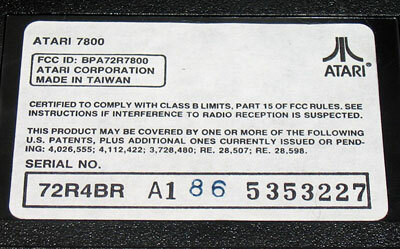 The 7800 even still has the cord storage for the RF cable, despite its RF cable being detachable! It also still has the indentations for the channel switch and whatever that other switch is on the bottom of the 2800 (I forgot to check before putting mine away). There really are just minor modifications, the biggest of which being, obviously, the elimination of two of the four controller ports. Oddly, though, what you’re seeing in these pics is not only because of the reflections – the color of the black plastic is slightly different. Could just be the age difference, but I think the plastic itself is different too. The 7800 has a greenish tint, the 2800/Video Arcade II has a reddish tint. The Video Arcade II feels slightly better built/thicker. I don’t really know what separates “Super Games” from regular 7800 games. Interestingly enough, all of the games listed here seem to be ports of older computer games (I have about half of these for my Apple IIc). Notice they say “games never before playable on a home video game system” – but given the large penetration of computers like the C64 and Atari’s own 8-bit line, I’m not sure how much of a selling point this was. Atari was probably the first console manufacturer to rely so heavily on proven “franchises”, and they did it from the release of the 2600 all the way up through the demise of the Jaguar. Ironically, it’s part of what killed them, whereas today it’s almost required for a system to be successful. Gamers in those days wanted originality – playing the same games over and over again but with better graphics and sound just got old after a while. These days, it seems like that’s all anybody asks for in a game console. Maybe Atari was just ahead of its time. Can I ask a question? I just got a 7800 used yesterday off Craigslist…and I know it’s supposed to play 2600 games… but do you need to put it into a different mode? Do you just jam the cartridges in the slot and it detects it? I’ve been trying to find a manual online…but found nothing that mentions that. Thanks! Yeah, the cartridges are the same size and the system auto-detects. There are a few 2600 games that the 7800 won’t play, and it may depend on the model year of 7800 (I’m no longer sure about this). But generally you just plug the cart in and it should play.